Scott Westerfeld's new book Afterworlds is the story of Darcy Patel, who at 17, sells a young adult book to a major publishing company. After high school Darcy moves to New York to become a full-time author. Interspersed with Darcy's story are chapters from Darcy's book about a girl named Lizzie who crosses over into the afterworld during a terrorist attack and is changed forever. Westerfeld's book is this crazy work of metafiction. It was strange (and sometimes wonderful) to be reading a book about publishing a book. To read a novel is to be taken to a new world, even when that world is based on our own. 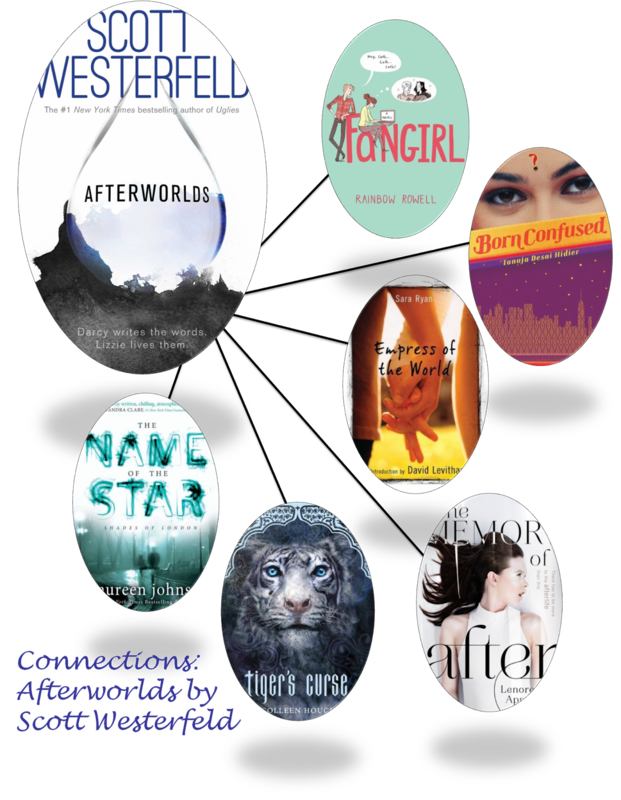 In Afterworlds the reader is reading about the creation of those fictional worlds and all the writing and rewriting, touring, editing, the agents, the editors, and the camaraderie and competition between authors that goes on behind the scenes. It was particularly surreal to read about Darcy's time at BookExpo America (which I have been to) and hear how many galleys of her book had already been downloaded (which is how I got a copy of this book). In a lovely little pairing, Westerfeld's Afterworlds comes out the same day that Darcy's Afterworlds comes out in the story, September 23rd, 2014, so, in some ways, Afterworlds feels like a book about writing the very book you are reading. It kind of makes my head hurt. And that comment that Kiralee makes about whitefellas plundering other cultures-that's at least somewhat directed at Westerfeld himself. Fangirl and Afterworlds: College-age girls with literary aspirations writing paranormal fiction. Cath's and Darcy's writing is interspersed with the story of their daily lives. Born Confused and Afterworlds: Daughters of Indian immigrants. Darcy Patel and Dimple Lala grapple with their cultural traditions. Empress of the World and Afterworlds: Two smart, creative girls fall in love. One is sure of her sexuality. One has never been in love before and didn't know she was interested in girls. The Memory of After and Afterworlds: The afterlife has multiple levels. It is closely tied to memory. Tiger's Curse and Afterworlds: Indian mythology mixed with the modern world. Yama is an Hindu death god. The Name of the Star and Afterworlds: Lizzie and Rory both have a near death experience and come out of it with the ability to see and talk to ghosts. The metafiction was probably my very favorite thing about the book. I much preferred Darcy's story. Because this is a book about publishing a book, Darcy's problems--her inability to maintain her budget, her conflicting feelings about her cultural heritage and its manifestation in her book, even her relationship with Imogen (which is her very first relationship and Darcy didn't even know she was interested in girls)--all takes a second seat to Darcy's constant worry that she is a fraud and that writing the book was a fluke. Honestly, it would have been nice to have more of all the other issues and less writer-related worries. Darcy's story is shared with Lizzie's, and Lizzie's story is a stereotypical paranormal. The first chapter is awesome with the terrorist attack and Lizzie's crossover to the afterworld (which is why her book got picked up in the first place). I think it's important to remember that Westerfeld's writing is not Darcy's writing, and Darcy's Afterworlds is a first novel by a talented but inexperienced author. It is somewhat satiric of the paranormal young adult genre and falls into the stereotypes that plague much of the genre--instalove, flat romantic male lead, cultural appropriation,etc.--while hinting at Darcy's potential. The best thing about Lizzie's story was seeing how Darcy's life experiences influenced her writing. I loved when Afterworlds was mentioned in the Darcy section and then I got to see how Darcy changed what she had originally written. As Darcy grew, so did the story. At times Afterworlds feels long. It is basically two books in one. However, I don't think it could be any shorter and still do all that it does. Afterworlds is out September 23rd, 2014. Review copy from Edelweiss.